Garden soils need amendments that contain calcium for good plant growth. Shells of all kinds make excellent calcium amendments for soil. Adding egg shells or crushed oyster shells to compost improves the growth of many vegetables, and helps avoid brown rotten spots on the bottom of tomatoes. 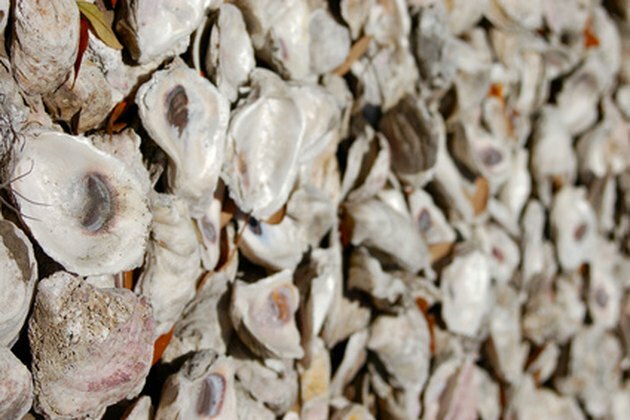 Before adding oyster shells, they must be cleaned. Un-cleaned shells added to a compost heap can cause bad smells, insect infestations and excess salt that can kill plants. Once the shells are cleaned, all of these problems disappear and your compost turns into rich, beautiful soil. Use old oyster shells to make rich compost for your garden. Place oysters in a sink filled with hot, soapy water. Let the oysters soak until the water is cool. Scrub the oysters with a hard brush, removing all dirt, meat and residue inside and outside the oyster. Drain the water, and rinse the shells thoroughly. Put on protective eye wear and rubber gloves. Plug the sink with the oysters in it, and turn on the hot water. Add 1 cap of bleach to the water. Fill the sink, and let the oysters soak until the water is cold. Drain the water, and rinse the oysters thoroughly. Plug the sink, and fill it with hot water. Let the shells soak until the water has cooled. Add liquid dish detergent to the water and scrub with the hard brush again. Make sure that all of the meat particles are off the oysters. Let the water out of the sink, and rinse the shells. Plug the sink, and fill it with hot water. Let the shells soak until the water cools. Put the shells on a thick towel, and let them dry. Sue Stepp is an artist, teacher, writer and farmer. She has won awards for her artwork in drawing, painting, jewelry design and doll-making. Stepp has taught classes for over 19 years in public schools, private classes, recreation centers, churches and at Hobby Lobby. She has a Bachelor of Arts in studio art/education. Can You Fertilize With Peanut Shells? What Causes a Musty Smell in the Kitchen Sink Drain?